In response to a reader complaining about too many Subaru WRX articles, can I just say there would be thousands who own this type of car who would not like to see less WRX-related info. This is the main reason I have joined AutoSpeed - keep up the good work. In regard to Issue 214's Response, Orazio Barbagallo wrote (in reference to his turbo diesel 4 x 4) "I have found almost no performance off boost in the lower gears ... my goal is not so much outright power as low down driveability and torque." In advising him to look elsewhere, you actually do yourself an injustice (hard to believe, I know)! I have found your DIY boost control (as fitted to your Audi S4) to be an excellent way of increasing off-boost performance. 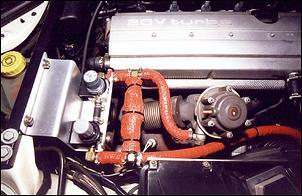 By stopping the flow of any pressure to the wastegate, boost builds sooner. There is actually more boost at all speeds up to the boost limit; never mind the fact that you can also add a couple of psi to the maximum boost. With diesel engines, the danger of boost spikes is very small compared to petrol engines and, of course, weak mixes are not any sort of problem. Neither is there a problem with power coming on too much of a rush. Orazio will find that fuelling is not the problem - the engine just isn't breathing enough air (oxygen) at low engine speeds, so anything to increase the amount of oxygen is of benefit. 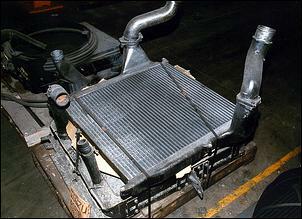 A large intercooler is another area that gives gains - by cooling, and thereby increasing the density of the air, diesel fuel that enters the cylinder burns better (meaning less smoke). A large intercooler may seem expensive, but by increasing burn efficiency it gives both power and fuel consumption benefits. Add the extra air courtesy of the boost arriving earlier and the increase in effective compression ratio, due to the better cylinder fill, really makes itself felt. The snag is showing this on a rolling road (chassis dynamometer). Gains are achieved where the engine is weak - below 2000 rpm. Most operators do runs that low, but this is exactly where your normal driving takes place. I initially went the more fuel and bigger intercooler route and it gave good results - but only while the engine was on boost. The bottom-end was still weak. I added the AutoSpeed DIY boost control and it goes a long way to filling the hole from 1 to 2 thousand rpm. That doesn't sound much, but remember these things are over the top power wise by 4500 and are geared at 25+ mph (40+ km/h) per 1000 rpm in top gear. I think it could still do with a bit better pickup from tick-over, but I'm working on it. Note that all figures relate to my BMW 2.5 straight 6 TD, I have no actual knowledge of a Ford Courier 2.5-litre. Incidentally, when setting the boost control up, I found it very useful to install a second boost gauge, temporarily, in the line between the valves and the wastegate. This showed exactly when the pop-off valve opened, and when it started to leak, as opposed to fully open. It also showed the interesting fact that 16 psi boost in the inlet manifold was achieved with 12 psi in the line to the wastegate. I put this down to pressure lost through the control valves. Watching both gauges showed me that a back-flow valve (the 1 psi jobbie) was of no benefit. I also used small-bore piping as it is easier and neater to run - internal volume is less of an issue too. Do some tests in low gears as well as high gears. When engine speed increases rapidly there can be an over-boost if the pop-off level is close to the maximum level. Here the danger is not from weak mixtures, but turbo over-speeding. It is useful to know at what figure the turbo starts to surge - then you know how close you are to the absolute no-go area. Stick to standard maximum boost, perhaps add a little bit, and you should be okay - remember, though, it's your engine and your repair bill. Do you get bored by repeated comments like "good mag" and "I like your hands-on approach"? I hope not, because here it is again! Thanks for the excellent feedback on your mods - there must be a lot of TD owners that will find all of this very interesting. 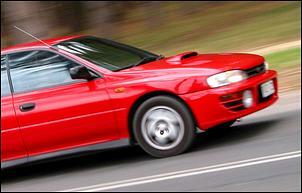 I am trying to get the email/fax/telephone contacts for the company that did the dog box for the Subaru WRX 2.4-litre. 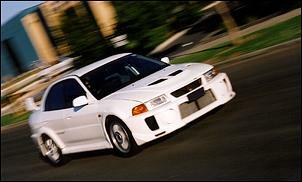 I have a Mitsubishi Lancer Evo 3 and want to know if there is any dog box for this model. Subaru dog boxes can be bought direct from MRT Performance (www.mrtrally.com.au). Brett Middleton - the man behind MRT - might be able to put you in contact with someone making Evo gearbox upgrades. He knows plenty about what's going on in the rally scene. "We get the ins and outs from two experts in car audio..." Experts? You're kidding right? Quotes from Luke: "Being from an audio engineering background I'm not a huge fan of MP3 - the compression format tends to sacrifice sound quality." The MP3 encoding scheme compresses audio by discarding artefacts that do not greatly alter the way the audio is *perceived* by the listener. These schemes are called psychoacoustic models. "You actually lose quite a bit because the compression brings the Nyquist frequency down to about 12k, whereas DVD audio is about 96k and CD is about 21k." All wrong. The sampling rates defined in the MP3 standard are 32, 44.1 and 48 kHz (Nyquist frequency of 16, 22 and 24kHz respectively. The Nyquist frequency of DVD is actually 48kHz, but records 24 bits per sample (compared to 16 bits per sample for CD audio, 256 times more quantization levels). Nyquist frequency isn't even relevant as an indication of the quality of MP3 as it is not a linear PCM recording method anyway. "For the average punter, though, there's not a lot of audible difference - the quality that you lose with MP3 in a car environment is very hard to pick. I mean, in a sound studio you can pick the difference between CD and MP3 quite easily, but - once in a car - it's a different situation." The differences between MP3 and CD audio referred to here are probably MP3 artefacts introduced by an insufficient MP3 bit rate or low quality codec. Not all MP3s of the same bit rate are created equal, as there are significant differences in output generated by different MP3 codecs as the various encoders implement different psychoacoustic models. "Minidisc is a great format for an in-car application - it's disappointing it has been overlooked. Minidiscs were great because you could pop it in the glovebox or throw it around under the seats and it wouldn't damage. Of course, with CD and MP3 you can always burn another copy if something goes wrong but minidisc was very durable. Like MP3, it was still a compressed format, but the loss wasn't quite as audible." Why is it great for in-car applications? Utilising ATRAC compression, MiniDisc requires more than twice the storage space as MP3 for an equivalent quality (subjective) recording. Mini Disc, while compressing audio to 1/5 of its original size, still only stores the same duration of audio as a regular audio CD. How many people have convenient access to a MiniDisc recorder? Most MP3s that end up on CD for playback have been downloaded from the 'net. In order to get these onto a MiniDisc, the audio would have to be converted from MP3 to PCM then to ATRAC. The resultant loss of quality from passing through two lossy encoding schemes would render the audio far from satisfactory. MiniDisc is in no way comparable to CD-R or CD-RW with MP3s. "That's basically interference from the car's electrical system. When you use RCA inputs the amplifier receives a voltage, but when you use speaker inputs it's just the power that's used to drive speakers directly. The input voltage used in RCAs is less likely to pick up noise than a speaker level input because it's a stronger signal." Wow... so when you use speaker level inputs you don't have any voltage? Are we on the same planet? P=VI, no? RCAs are not a 'stronger signal' - in fact they are probably around 1/10 that of the speaker level outputs of a typical deck. 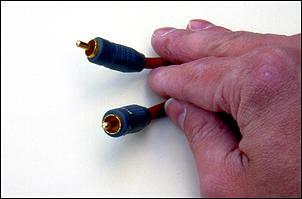 RCA leads have greater immunity to electrical noise than typical speaker wire due to better insulation. I think what Luke is getting at here is that a well insulated RCA lead will have a greater signal to noise ratio than a typical speaker wire, despite is lower voltage. "You'll get distortion - simple. If you push a deck to near it's maximum output you'll get a lot of distortion." Ever heard of clipping? This is very basic amplifier theory... The amplifier can only amplify a signal to the same level as its own power supply (DC-DC converter within the amplifier). Once you set the gain so high that the amplified signal hits those voltage rails, no more amplification can take place and the waveform is squared off (resulting in near DC waveforms being sent to the speakers, which will very quickly cause damage). Sorry to piss and moan, but if you are going to tout someone as an expert, please at least try to verify some of their claims to establish some level of credibility. 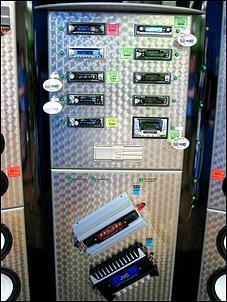 Car audio is an industry full of people who claim 'know it all', but don't know jack. I don't claim to be an expert at all (I don't even work in car audio), but there are many obvious holes in these statements. Building an adjustable temperature alarm - and more! The beginning of the end of a 60-year era?